We started today very early. We were out of bed at 4:00 am and on the road back to Oneonta at 5:00. We met our dear friends Donna and Barry for breakfast before early church. This will be our last time to worship with our friends at Lester Memorial for about six weeks so it was definitely worth the effort to attend. We had a good time visiting with Donna and Barry and then had another great time of worship. Our praise band seems to be just getting better and better under Chase’s leadership and Pastor Harvey’s messages are always such a blessing and today was no exception. The services are streamed each week on YouTube (link) so you might want to listen in sometime. We are so glad we can listen when we are on the road. After Sunday School, we spent some time with the Aunts and then checked on Aunt Helen’s house and then our house to be sure there was no damage from last night’s storm. Thankful we found no problems at either place, we headed back to Deerlick Creek in Tuscaloosa County. It was a beautiful Sunday afternoon and we took advantage of it, walking over 7.5 miles today. The dogwood trees are in full bloom in the woods, as are some other things we can’t identify. The trees are all greening up and the grass is too. Spring time in Alabama. Love it! We forgot to tell you, we keep cameras around the house. When we check them, we find we have a lot of visitors. The deer are no longer afraid to come right up to the garage including a couple of really nice bucks. Along with the coyotes, turkeys, raccoons, possums, rabbits and squirrels we have also had a bobcat, a fox, and a river otter. So cool! We know there has been a sighting of a black bear on the mountain. It sure would be nice to get a picture of a bear. That’s it for today. We are going to have another storm come through tonight or tomorrow so everyone stay safe. When we returned to Deerlick Creek we were greeted by this little fellow near our doorstep. 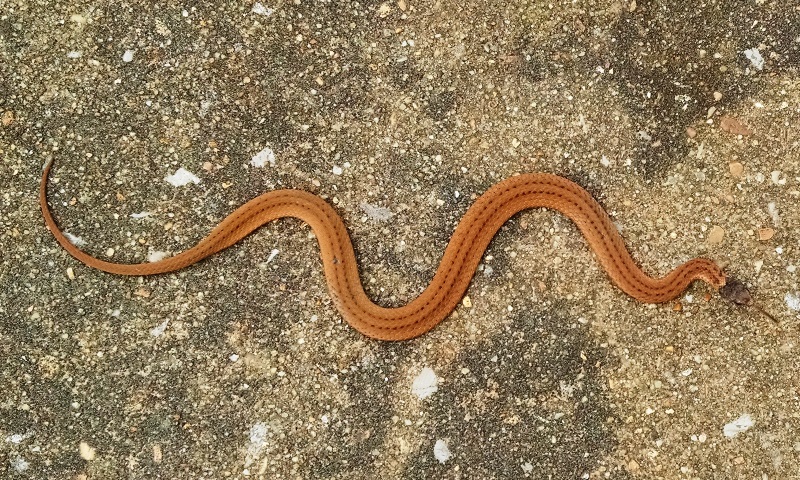 It is imaginatively named a “brown snake” and is common in most of the south. Most people have never seen one because it is usually less than 12″ long when fully grown and spends most of its time hiding under debris on the forest floor. This one was only about 8″ long. We shooed it off the pavement so we wouldn’t accidentally step on it.